Warmish days. Cold nights. The sap’s a’runnin’. 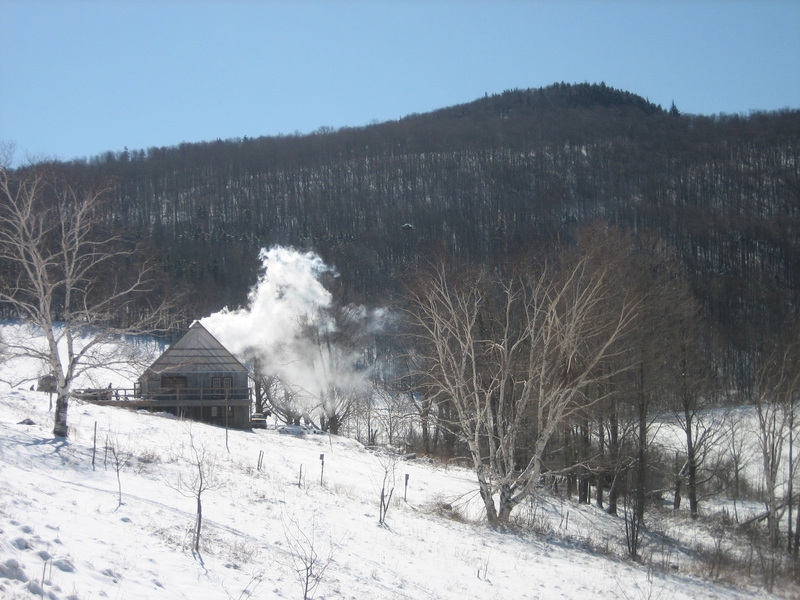 Sunday, a bright sunny day, we went up to Merck Forest and Farmland for their annual sugaring celebration. A few years ago, they built a massive sugar house on the property, within walking distance of the visitors center. It’s a two-story building that houses the largest evaporator I’ve ever seen. We ate blueberry pancakes with fresh grade-A dark-amber maple syrup. We ate sausage made out of previous farm residents of the swine persuasion. 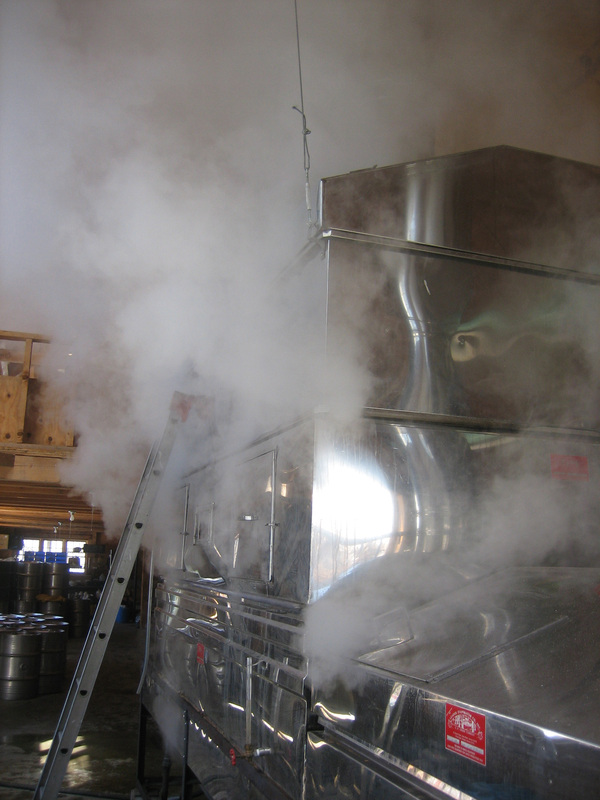 We allowed ourselves to be enveloped in thick sweet steam, like a sauna. The wet sweetness that fills the lungs as the sugar boils—the surrounding outdoor air just warm enough that you can begin to smell the forest again—takes me right back to my college days when we’d head out to sugar at our school’s field station on the lake. Back then we collected the sap in buckets, grabbing them off the trees and emptying them into a tank on a flatbed attached to an ancient tractor. It was great exercise and great fun (as we usually limited it to a weekend or two, and it wasn’t our job or our livelihood). I don’t think the college added IV lines to that operation until sometime after I graduated. Here in Vermont, you can see these blue tap lines all along the roadways. They aren’t as aesthetically pleasing as the buckets, but they are, obviously, way more efficient. 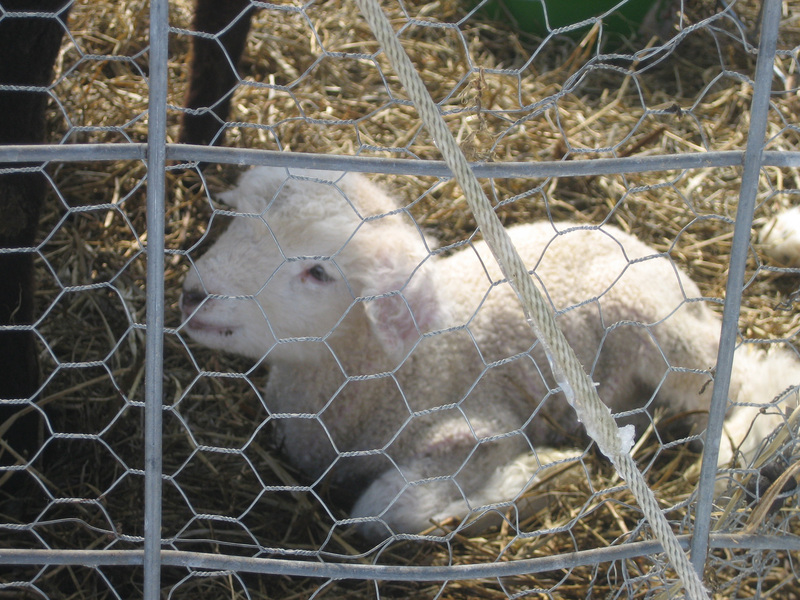 Lambing happens about the same time as sugaring, and already many lambs have made their debuts. One ewe was in labor during our sugar stay. She was surrounded by spectators, and she was having a hard time. I didn’t stick around, but I heard that she eventually got a little human help, and her lamb was born safely. Today we are in the midst of mixed precipitation. Tomorrow it may be 60 degrees F, but rainy. Possible thunderstorms. On Route 30 today, I saw the steam rising from some of the smaller operations. Last night I attended a mac-and-cheese bakeoff at the restaurant one town over. The one where Beatrix Kiddo works as a bartender. Some of you 365ers will remember her. Apparently Beatrix came up with this idea after hearing at least two people repeatedly claim that they make the best mac and cheese ever. She decided to call their bluff. Then friends of hers found out that their 8-month-old daughter has cancer. So she turned it into a benefit evening. I picked my sister up on the way, and we met my freshly shorn husband there. Alison and I beat the crowd and planted ourselves at the end of the bar. Beatrix, who would soon be quite overworked, happily served us, being sure to remark, “Really slammin’ ’em tonight, eh?” as I ordered my second beer before the tasting began. There were twenty-four entries. Twenty-four. We were given a long strip of paper with twenty-four numbers on it. The idea was to tear the numbers off and place them by the mac on your plate, but, well—you can imagine. I don’t think twenty-four tastes would have even fit on a plate. Once you’d determined your mac of choice, you’d hand your greasy numbered vote to the emcee. In retrospect, we should have had a better plan. We could have assigned eight tastes per plate to the three of us and been organized about sharing. I went back after the first plate, theoretically to try the ones I hadn’t, but in the end, there were entries I didn’t try and a few entries I doubled up on. We spent a good bit of time talking about the merits of ones we liked with Grid Gal, a 365er who abandoned the project way too soon and whom I run into about once a year. We agreed that Leo’s entry was pretty damn good, what with all that fresh shrimp. One guy—Frank?—had set up his like a shepherd’s pie, over beef. But both of those guys cook for money, and even though I had seconds on both, one could argue that neither was mac and cheese in its purest form, an argument that is quite comfortable to make while taking a few more bites of those sullied entries. Fat Red Ant’s mac and cheese was, in fact, freakin’ awesome. Perhaps I didn’t care enough to take the time to be truly scientific and discerning, but I had no problem casting my vote her way. (I’m not sure the others were so easily swayed.) Sadly, she faced another challenge: she and Shepherd’s Pie Guy were assigned numbers that—upside down—could be read as the other’s. Nine, I wrote on a tiny piece of paper. We didn’t stay til the end of the evening. We ate, drank, were merry, dropped bucks for a good cause, voted, and went home and collapsed. I e-mailed the Ant this morning for details as to how it all turned out, but I’ve heard nothing back yet. I don’t think that’s a good sign. Saturday night Paul and Lynda had their third annual neighborhood potluck. They try to keep this gathering as local as possible. Almost everyone walks to the party. Almost every attendee lives on Route 153 or within a stone’s throw. We’d been there a couple of hours when our houseguests—Tim’s sister and her beau—arrived for the weekend at our place next door. Tim brought them over. They got a pretty good feel for the ’hood. And there are, surprisingly, a lot of artists, although most of them have to do something else for cash. His question did get me to thinking about what occupied the people in my neighborhood. At the party, you could find a couple of jacks-of-all-trades who work for themselves. A couple of lawyers. A sculptor/stay-at-home dad. A tai-chi instructor/sometimes bartender. An elementary schoolteacher. A landscaper/ceramicist who wishes she could just focus on her tiles (which are beautiful). A speech-language pathologist. A guy who works with troubled kids within the school system. An art director for one mail-order catalog company, a buyer for another. A full-time artist. An antiques dealer. Some retirees. A stonemason. An editor. A soon-to-be medical transcriptionist. A baker/food pantry organizer. A guy who works in some aspect of food service. A couple just ending their many years of running a summer horse camp. Parents everywhere, a dozen children running underfoot. Some potential homeschoolers. I don’t know for sure what everyone does. But I do know that I work in a neighborhood of hardworking people. Some very impressive hardworking people. Some very impressive, hardworking, good-hearted people who bring some mighty yummy dishes to potlucks. That which has felled so many neighbors has caught up with me. I was in bed all day yesterday, sleeping, half-awakening to the sounds of snowplows. I had so many plans for this weekend. I am a bundle of disappointment.